In all of his work, Edsel melds aspects of Art Nouveau, Beaux Arts, and Viennese Secessionism into a unique personal style intent on beauty of line. Get to know more about Edsel and his style, as well as his love for WoT here! TT: What got you into reading WoT in the first place? EA: I was friends with someone on a collectibles board and she found out I was into the fantasy genre but couldn't find anything new to read. Her boyfriend was reading the WoT books and had her hooked, so she suggested I try them. After she found out he cheated on her, she broke up with him -and the series - but I've been hooked ever since! TT: What made you decide to begin drawing characters from WoT? EA: As an Architectural Designer, I've done a lot of watercolored architectural/interior illustrations, but I've always harbored a desire to be a fantasy illustrator. A few years ago I decided I needed to push myself toward that goal, and I made myself paint a scene from the book to show Harriet and Brandon at an Atlanta book signing event, just to see what kind of reaction I got and if I was headed in the right direction for myself artistically. I just loved the WoT, so it was a natural subject! TT: Why draw the Forsaken first and mainly, so far? EA: Actually I'm 3 good for 3 bad, alternating Mat/Tylin, Selene, Nynaeve, Graendal, Birgitte, Semirhage. I've really painted characters that intrigue me the most. But I have OCD, so I'll have to complete the Forsaken set! The real question for me is why do I seem to keep painting men in submissive roles? TT: Why have you chosen to mainly work in the art nouveau style? What attracts you to it and why do you think it’s a good fit for the Wheel of Time pieces you’ve done? EA: I'm really a designer, more than a painter, and I'm really drawn to styles that are also architecturally related: Art nouveau, art deco, Viennese Secessionism, and Moorish and Byzantine patterns. Linework is really important in all these styles. It's why I like comic art, as well. EA: Because that's how we are introduced to her, and she's so intriguing at first. Is she good? Is she bad? When she's Lanfear, I'm just trying to figure out her angle, but I never trust her. 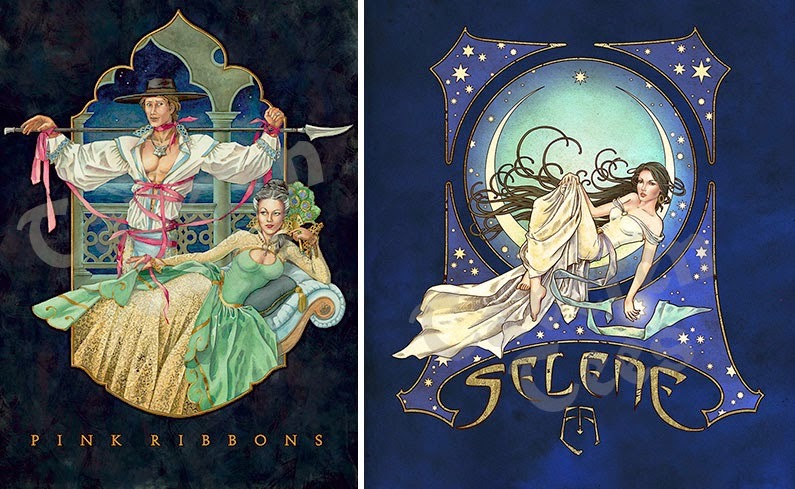 Also, I wanted to do something Art Nouveau and Selene fit in so many ways. I don't think you could just change the label on this. I'd picture Lanfear completely differently. TT: So many people choose to show Mat’s warrior/Son of Battle’s side. For the “Pink Ribbons” piece, why did you choose to portray that time in Mat’s storyline? EA: This is the painting I took to the book signing. I hoped it would make Harriet smile. Mat grew into one of my favorites mainly because he's just plain fun, yet loyal and good in spite of himself. This scene shows one of his most fun off-screen moments. Plus, with his unfair luck, it's a riot to see him off balance. Their relationship kept me amused, so I loved that he's really loyal to Tylin. It's hard to believe Mat actually irritated me in the first few books.